Compact plum and currant aromas are floral at first then more spicy and foxy as this blend led by Syrah and Carmenère airs out. 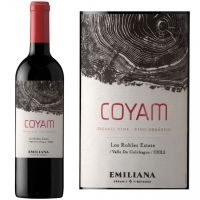 A tough palate flush with tannins deals spicy, herbal plum flavors with ample chocolate and spice from oak. On the finish, this dries out and tastes peppery. Drink through 2022. Coyam is an intense violet plum red in color with a nose that expresses aromas of ripe red fruits, plums, berries, and black fruits that meld elegantly with notes of spice, earth, and a touch of sweet vanilla. Well balanced and big bodied on the palate, with good structure and soft, round tannins. An intense, complex wine full of character. Recommended for cellaring.